The last thing producers may want to think about in the middle of the growing season is extending the growing season. However, that is just what many Community Supported Agriculture (CSA) business models are doing across the state to meet consumer demand for fresh, vibrant food. Many farmers are finding that summer share customers desire to eat local twelve months out of the year. Serving this niche market can open a revenue stream, with winter CSA boxes bringing in an average of $40 a week in Western Pennsylvania, and this income can help farms offset those winter purchases for the upcoming summer season. Market value for boxes varies in different geographic regions due to particulars such as hardiness zone, storage, growing facilities, transportation, and customer base. 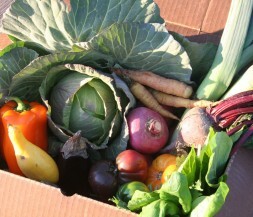 Many winter CSAs quickly fill and have waiting lists. In this post, we discuss some considerations for cultivating produce sales during the winter months. Your farm may excel at storage of apples and squash, but how will that satisfy customer demand? Talk to other growers in your area to explore the idea of a cooperative winter CSA. This model has been successful in many places, with several producers contributing cider, produce, baked goods, grains, and other items to round out winter shares. A challenge with this model is coordinating pickup and delivery, but once that schedule is worked out, transportation costs can be shared, as well as revenue. Planting greens can bring in the green. If selling produce in the cold months to bring in the cold cash is attractive, understanding plant biology is key to properly selecting plants which can be successfully grown and stored during the 'off season.' For instance, working with plants that germinate in cold temperatures, or have slow respiration rates to provide longevity in storage is key to having marketable produce. Set up your business for success by selecting cold hardy plants to grow or store instead of planning on heating a high tunnel with propane all winter, a sure budget buster. Many cold hardy greens such as kale, chard, spinach, cress, and mache will survive hard frosts and even light freezes with some protection from desiccating winds. Many Brassic species, carrots, and leeks also perform well. Many customers enjoy visiting farms during the growing season, and winter CSA on-farm pick-ups can provide opportunities to extend a farm's agritainment season while boosting sales of value-added products. Options for customers could include cross-country skiing or sledding on the "back 40," sleigh rides in the snow, sales of hot cider and hot chocolate, and offering farm branded value-added product lines to add to the standard box at pick-up are all ways to cultivate year-round revenue streams from high season customers. Just make sure to check with your liability insurance if having customers on-farm is new to you. Convincing customers that root crops are delicious is critical to your marketing strategy. Many committed locavores may turn their nose up at a celeriac root, but one taste of a creamy soup or roasted version of this strange looking vegetable is enough to send a creative cook home with your product, inspired to slice and dice. Since many winter crops have this image problem, tap into a niche customer base willing to take the chance that parsnips really are sweet and delicious, and have the fortitude to tackle a large squash to create seasonal recipes. The trick from the producer standpoint is creating storage to slow the respiration and decay process. Just remember to control temperature, humidity, ethylene, and provide customers with recipes. Here are some considerations to help you with successful profit margins. As with many things in life, good timing is everything. Timing fall plantings correctly can help maximize profits and efficiency. Marketing these frost-kissed vegetables can be creative as the sugar content concentrates with exposure to cold. Carrots can be marketed as "candy carrots." What mom doesn't want to buy those for her kids? Making sure greens are teacup sized before planting in mid-August will help ensure the plants are mature enough to withstand cold stress. Carrots should be thumb-sized before frost to be successfully harvested after frosts, and again in late winter/early spring. 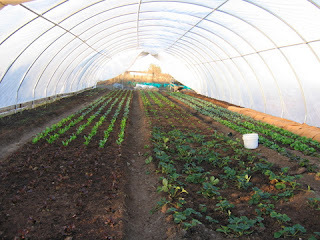 High tunnel production for winter CSA. If fresh greens are more to the taste of your customers and growing prowess, here are some upfront costs related to production to turn greens into "green." To provide protection to field crops when the cold northern winds start to blow, consider investing, as a minimum, in row cover cloths on homemade metal or flexible PVC to create low tunnels. Two layers of row cover cloth can keep mature cold hardy greens alive through the December holidays. Some producers report success in keeping crops alive through winter with a kind of dormant period in January and February. Keep in mind, harvesting from low tunnels is difficult work, so if the investment of a high tunnel is feasible, it will make the winter work easier from a physiological standpoint. Remember to cover plants in high tunnels with row cover. Planning for a new business venture can seem overwhelming during the day to day management of an existing business. Farming on paper is worth the time, as calculating upfront costs and comparing them to projected cash flow is what it takes to assess potential profitability. Extension can provide technical assistance in the development of CSAs via production, marketing, and business development support. For further reading on this topic, please visit Penn State Extension's Ag Alternatives website for publications on CSAs and Cooperatives.